Most claims of ‘first recording’ status don’t stand up to scrutiny, so it’s wise of Hyperion and Coro not to make them for either of the Masses presented here. But the quality of both works is such that their neglect in the discography is puzzling. The Brabant Ensemble specialise in comparatively out-of-the-way Renaissance repertoire, so their choice of the Missa Ad coenam Agni is in this sense logical. It has a canonic pair of voices nearly all the way through, a constraint that Palestrina negotiates while quoting the plainchant as well. It’s quite a feat, but canon doesn’t cramp his style as it sometimes can; in fact, it’s written in something like his grandest manner, which is instantly familiar. (For what it’s worth, the closing passage of the Credo recalls the subject of the final fugue of Messiah.) The Brabants seem very much at home here, more so perhaps than in some of their less familiar stylistic excursions. The accompanying motets are almost all celebratory in feeling, even when the subject might suggest a less optimistic reading (as in Terra tremuit); they respond in kind. 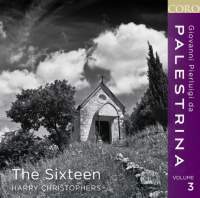 For the third instalment of his Palestrina cycle Harry Christophers has chosen an equally sumptuous five-voice setting on the Regina caeli plainchant. 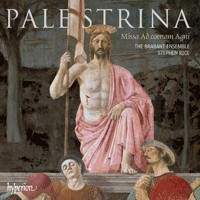 His approach as conductor is in some ways more interventionist than Stephen Rice’s with the Brabants but only rarely sounds that way; and in this style of interpreting Palestrina, The Sixteen are sensitive and remarkably assured. Both qualities show in the opening Stabat mater, and the remaining motets are nicely contrasted in mood. My only reservation concerns their Ad coenam Agni, in which the matching of pitch-levels for polyphony to plainchant is a little uncertain. The duplication of three pieces between both discs is a coincidence that should deter no one from buying either disc. The magnificent eight-voice Regina caeli setting allows one to compare both choirs’ respective qualities. That said, The Sixteen’s Palestrina cycle may just be a classic in the making.